I’ve never spent much time with Apple’s Automator technology. Which is a little strange, considering how interested I am in automation and workflow technologies. I think some of it is a sense that it seems inaccessible, it doesn’t seem clear how to make things generalizable enough to be useful, and at least part of it is my aversion to Applescript as a scripting language That said, it’s clear that there is a lot of power available with Automator and I’ve started to dip my toe in the water and seeing If I can learn a few things and maybe create something useful. This is the first fruit of my experimentation. I often need to make a tape log of a sequence in Final Cut Pro, and a quick way to get the sequence details into a text file could be useful. The most approachable way to address the problem seems to be with markers. 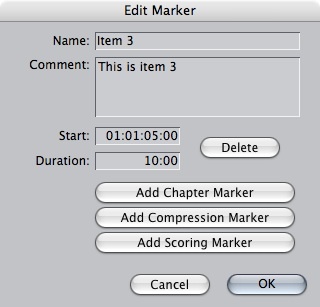 You can store all of the values I need for a tape log in a marker – item number, name, description, length and the starting timecode. So, that’s how we’ll approach it. 2. We’ll want to rinse and repeat for each item we want in the log. 4. Launch the workflow, markerToLogWorkflow.workflow which should look like this. That’s about it. Next up will probably be digging into Indesign Automator Actions so that we could flow our log into a nicely formatted document. Another interesting Action might be to do this in reverse adding Markers from a producers Excel, Word Doc, or XML File, but I’m happy with this as a start. So, what do I think about Automator? It definitely takes a little getting used to, but if Apple continues to improve features, I’ve heard rumors of cool Leopard upgrades, then I think it will be a good application to add to the mix. 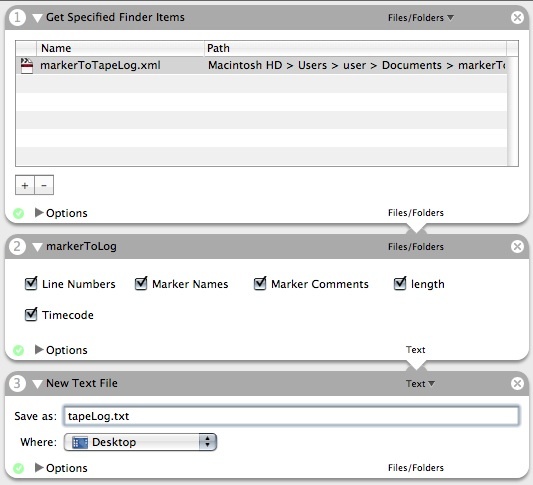 You’ll need to move the markerToLog.action file to your Library/Automator folder for the Workflow to work. You’re idea “Another interesting Action might be to do this in reverse adding Markers from a producers Excel, Word Doc, or XML File” is very intriguing. I’m not familiar with InqScribe, but if it has a data format it’s likely to be transferable and mungable. If you send an example I can maybe give you some pointers on how to address the problem. This is a great little tool. I’m no expert on Automator, but I wanted to have a crack at editing this so I can remove the preceding 01: and the frames from all the timcodes to get it into a format I need. Is there source of your Automator action available? Sure, I can make the source available. Just shoot me an email and I’ll bundle it up for you. Also, if you uncheck “Line Numbers” in the markerToLog section of the Action it should eliminate line numbers. You can also add or subtract other items in the text file at this stage of the workflow. Did you ever happen to try making the reverse import into FCP? I haven’t followed up with this project. It was more of an experiment and the demand was fairly low compared to some of my other projects. Are you in the freelance market? Perhaps we could pay for some further experimentation? which is a Swedish application that only accepts Paypal in the Dutch language. I just tried out XML Reader, it didn’t do what we wanted. I found your great post, downloaded the action and workflow, fired up automator and it works better than we hoped. We use mostly Avids (blah) and this function is built into those systems, but strangely enough, FCP still has no function like this built in. Thanks again for this post. My life is easier as a result of your work!! Hi, this is a great workflow hack. Just thought you might be interested that the cool new feature in Leopard you talked about in the end of the article have come to fruition. I’ve got a post on the application of the new “watch me do” function. Just thought you’d be interested if you’re into automation. Can you try exporting from a sequence and not just the browser? The action expects a sequence in the XML. Great stuff. Hey has anyone ever thought of, or built, a workflow to convert markers to text generators? As in, place markers over a sequence, export XML, then text process that to generate a new sequence, which would only contain a video layer composing of text generator clips, each of which would have the text from the marker name field displayed? That would be super handy…..
I’m an AVID guy, very new to FCP…I’m looking for some small app I can give some sales reps who are clipping out time code dubs with clips they want. They are typing the numbers into a word doc and I have to transcribe it into FCP log tool…is there some small app (PC and mac) I could give them to create XML which would make clips based on their TC input? I appreciate any help you guys could offer. Do you know if it is possible to use Automator for placing multiple clips into a sequence in FCP. I am attempting to figure out if I can automate matching the timecode of my clips to the timecode of my sequence. Since I will be having a ton of this kind of work coming in I was hoping to automate the process to speed things up. I have spent all day looking for something very, very close to your automator action. You offered elsewhere in this comments section that you would be happy to give the source code out as a bundle, but I can’t find your email on this page. If you’d be kind enough to share it at the email I’ve provided here, I would be most obliged. Either way, thank you and best wishes. Hi, your Automator Action seems it might help me export markers. But it doesn’t seem to work on an Intel iMac. Is there a way I can get it to work? Yeah, I noticed this Action was out of date recently. I need to dig into it and see what’s up, but of course I have deadlines like everybody else so it’s hard to commit to a timeframe. If you’re technically inclined I’d be happy to send the source so you can dig into it. yes, I can imagine that you pre-occupied with work, etc. And I don’t expect you to pull the ol’ rabbit out of the hat. But I appreciate that you have taken the time to reply. I am technically inclined, or rather if I need something done I get on with it. If you can send me the source I’ll have a tinkle.